Sanyo has launched a new cheap and cheerful Xacti camcorder. It's for users who want something that looks cute, doesn’t break the bank and is fine for taking the odd home video of the kids or for messing around on the beach with on hols. 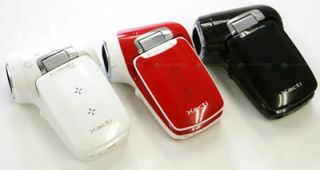 The entry-level Sanyo Xacti CG9 was apparently developed in close consultation with Japanese women, which is the reason for the cartoon-like, chunky and fun aesthetic. Spec wise, well, you gets what you pays for, which is 9.1-megapixel still image capability, a 2.5-inch LCD screen, 40MB of internal memory (with SD/SDHC extension), 5x optical zoom and H.264 video codec. The Xacti CG9 will be available in the States as of mid-April 2008, priced $279.99 (£140) in silver or black.